Staff members Xana Plum (left) and Jennifer Combs transport a "victim" during an exercise in 2017 C-CERT training. Photo by Arden Barnes. LEXINGTON, Ky (Aug. 28, 2018) — As natural disasters can bring costly and deadly impacts to our communities, the capability of deploying thousands of trained civilians can ease the pressure on first responder professionals during the chaos of a disaster like an earthquake, wildfire, flood or tornado. The University of Kentucky Police Department recognized the need for a Campus Community Emergency Response Team (C-CERT) and launched its first training for UK faculty and staff in 2014, joining CERT programs that have grown from a handful to about 2,800 nationwide over the past 25 years. Beginning Tuesday, Sept. 18, C-CERT training will be held for five weeks in The 90, each Tuesday from 8 a.m. to 4:30 p.m. and ending with a mock disaster exercise Tuesday, Oct. 16. This is the fifth consecutive year UKPD’s Division of Crisis Management and Preparedness has offered C-CERT training, applying an established curriculum from the U.S. Department of Homeland Security with added modules applicable to the university environment. Registration for the 2018 training is open now through Sept. 14. Class size is limited, and enrollment is on a first come-first served basis. The training is free and open to regular full-time faculty and staff. To register, please click here. C-CERT volunteers are intended to serve as “multipliers” in emergency response — not substitutes for the services delivered by professional first responders, said UK Police Chief Joe Monroe. That means they receive basic training on disaster preparedness, first aid, medical triage, and light search and rescue. Basic first aid includes treating burns, sprains, broken bones, wounds and other common injuries during emergencies. Medical triage requires volunteers to quickly assess the injuries of victims and determine who has the most urgent need for care. The medical triage portion of the curriculum, for example, teaches volunteers to employ a universal system used by emergency professionals that involves tagging victims with different levels of injuries using green, yellow, red and black tags. Volunteers are taught how to mark buildings during search and rescue operations, communicating information about the search, such as the time, date, areas searched and locations of victims. The basic CERT curriculum is meant to ensure volunteer teams from different geographic areas can work cohesively, and the handoff to professional emergency responders goes smoothly. Some 75 faculty and staff members across campus have gone through training. Laurel Wood, the UK C-CERT program coordinator, said these volunteers find that the basic emergency response skills they acquire, such as using a fire extinguisher or assessing basic injuries, are skills they can also use in their personal lives. “Every unit and model from the C-CERT training program may be utilized in the work place as well as at home,” Wood said. An accident while at home carried an important reminder of why Professor Tim Taylor of UK’s Department of Civil Engineering signed up for the training and mock disaster exercise in 2015. UK faculty and staff who want to participate in the C-CERT training this fall will be expected to obtain approval from their supervisor to attend 40 hours of training and submit to an electronic background check. 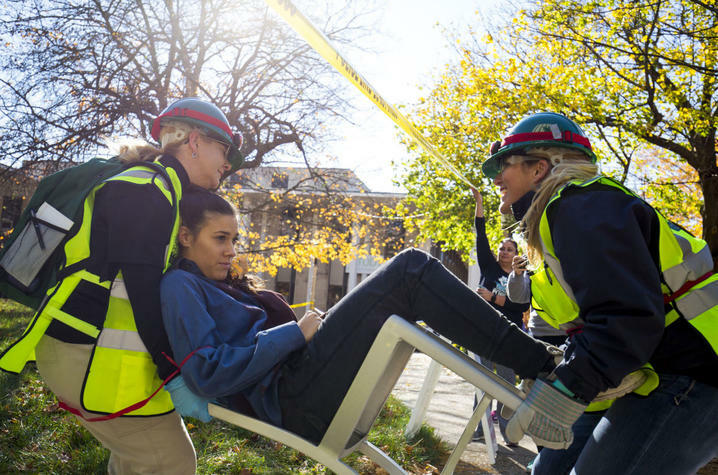 Refresher trainings on a variety of topics are planned each year for UK C-CERT members along with opportunities to utilize these skills in responding to campus events or emergencies. To find out more, visit UKPD’s C-CERT website, UKPD Facebook page, or contact Laurel Wood by calling 859-257-6655 or by email at laurel.wood@uky.edu.